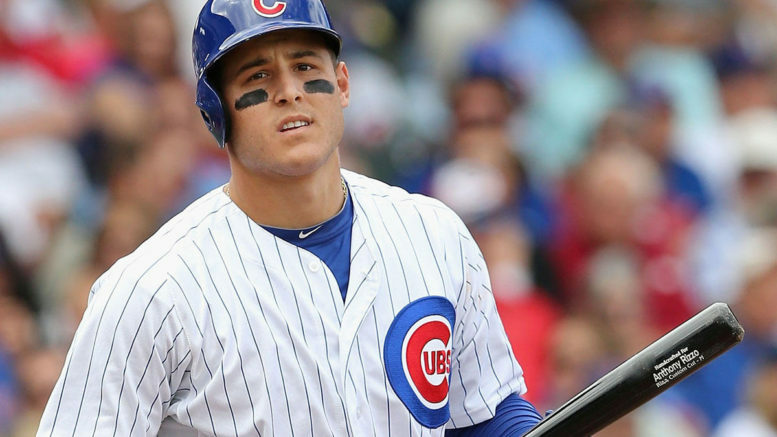 Anthony Rizzo and the Cubs should be well rested for the NLCS against the Dodgers. It’s round two for Toronto and Cleveland, with these cities also having squared off in the NBA Eastern Conference Finals back in May. Cleveland got the best of Toronto then, 4-2, and LeBron James ultimately led the Cavs to the city’s first championship in 52 years. Will the Indians follow suit? This should be a terrific series, and the teams have the track record this season to prove it. In one of the classic games of 2016, the Indians traveled to Toronto on Canada Day (July 1) and it took 19 innings to end a 2-1 stalemate that went in favor of Cleveland. It was the Indians’ 14th straight win, the Majors’ longest win streak of the year. Don’t expect 19 innings, but this should be fun. The Blue Jays would appear to have a big edge in starting pitching, which is hard to argue considering the Indians are only begrudgingly shifting to a four-man rotation after going just three-deep against Boston. This is where, in the eyes of many, the injury losses of top-flight starters Carlos Carrasco and Danny Salazar will really hurt the Tribe. Rookie Mike Clevinger, he of only 53 Major League innings, will toe the slab in Game 4 and make his postseason debut. The bullpen edge goes to Cleveland, even as Toronto’s has stepped up in the playoffs against strong-hitting clubs in Baltimore and Texas. Roberto Osuna has stayed sharp despite being quite overused, and the Jays have been able to adequately compensate for the loss of Joaquin Benoit. But they certainly don’t have a weapon like Andrew Miller, who looks like the steal of the trade deadline. He, along with Baltimore’s Zach Britton, is the cream of the crop as far as left-handed relievers, and has plenty of experience facing Toronto from his AL East days. Miller and Cody Allen are a powerful back-end tandem that could give the Jays’ offense fits. Of course, that Jays offense is probably the superior one here, if only slightly. People seem to lose sight of the fact that it was the Indians — not the Jays — who finished second to the Red Sox in the AL in runs scored this year. Both clubs hit for power, but Cleveland has an edge in team speed. The Blue Jays are a slightly better defensive team, most notably Kevin Pillar in center field. So where do the scales ultimately tip in this ALCS? One thing that stands out to me is this year’s Indians club’s resemblance to last year’s Royals, who downed the Jays in six games in the ALCS. A scrappy, small-market, seemingly-overlooked team with a deep bullpen proved to be a winning formula against Toronto in 2015, and that, coupled with homefield advantage, could be the difference maker here. As tempting as it is to be lured by the sizzle of the Blue Jays, this Cleveland team, led by two-time World Series champion manager Terry Francona, just has that intangible quality that championship clubs seem to have. Sweeping the mighty Red Sox, with two one-run victories, is no small feat, and something special is happening in the city of Cleveland after the Cavs’ epic comeback against the Warriors in the NBA Finals. I picked the Jays last year in this spot and should have known better, so I’ll flip the script this time around. Prediction: Indians in 6. This one looks easy, right? Especially after, as I joked, the Dodgers won the “NIT Bracket” of this tournament by knocking out the playoff-inept Nationals in a grueling fifth game last night. Los Angeles expended all of its bullets to get here, riding closer Kenley Jansen for 50 pitches before bringing Clayton Kershaw back on a mere day’s rest to nail down the 4-3 win. All of this while the Cubs were kicking up their heels and getting some much-needed rest back in the Windy City. The Cubs seemingly have the edge in every department of this series — starting pitching, bullpen, offense, and defense. But because it looks so darn easy, my hunch is that it won’t be. That isn’t to say the Cubs won’t win and get back to the World Series for the first time in seven decades, but there are a few things the Dodgers actually have going for them, even if you believe they are spent after their tough series with Washington. First off, there is something that none of the three previous Dodgers teams to reach — and ultimately lose — the NLCS have on their side: an underdog role. This high-payroll, Hollywood-cool team has suddenly turned into a bunch of grinders, finding ways to win and surviving and thriving in Kershaw’s lengthy absence this summer. This $227-million-payroll team is playing loose and relaxed and, dare I say, with house money. No one has any earthly idea what to expect from first-year Dodgers manager Dave Roberts as he matches wits with one of the game’s best in Joe Maddon. Kershaw could be available to start Game 2 on what would have been normal rest if not for his bullpen appearance last night, and that could put the Dodgers in a brilliant position if they are somehow able to steal Game 1 with Kenta Maeda against Jon Lester. Of course, let’s give the Cubs some due love here. They won 103 games, the most in baseball since the world champion 2009 Yankees, and sport baseball’s best rotation. They showed they have October moxie with Tuesday’s four-run ninth inning comeback in San Francisco to cap their NLDS win, and are also pretty loose and relaxed for a team that has been expected to do great things almost from day one in 2016. These teams matched up pretty closely in the regular season. The Cubs had far and away the game’s best run-differential at +227, but that number was a mere +3 in seven regular-season meeting with L.A. Chicago won four of the seven meetings, taking three of four at home but dropping two of three at Chavez Ravine. Given the fact that the outdated 2-3-2 format could rear its ugly head for Chicago and turn this into a full series, the Cubs will have to earn this one. I believe they will, but after waiting potentially 108 years for another World Series title, what logical Cubs fan should expect this to be anything but a struggle to the very end? Prediction: Cubs in 7. Be the first to comment on "Final Four: Baseball’s Tournament Reaches LCS"